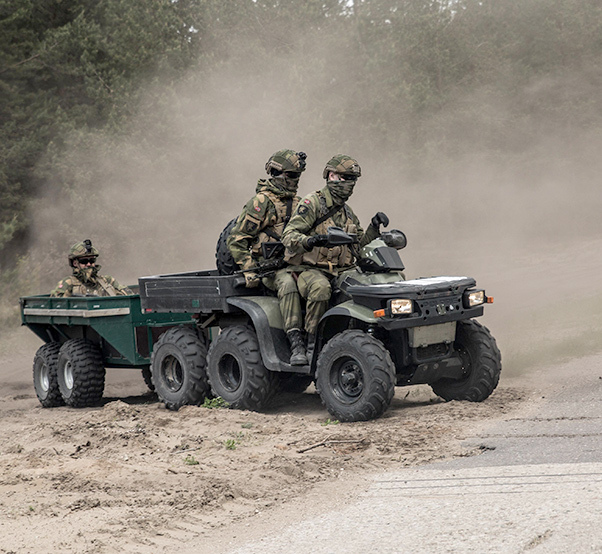 Soldiers of the Norwegian Armed Forces drive through training areas surrounding Camp Adazi, Latvia, during preparation for Exercise Saber Strike 17, June 2, 2017. Exercise Saber Strike 17 is an annual combined-joint exercise conducted at various locations throughout the Baltic region and Poland. The combined training prepares NATO Allies and partners to effectively respond to regional crises and to meet their own security needs by strengthening their borders and countering threats. Allied and partner nations have unfurled their flags for the opening ceremony of Exercise Saber Strike 17 on Adazi Military Base, Latvia, June 3, 2017. The exercise began with Maritime Prepositioning Force operations, on May 22 and now transitions to combined live-fire exercises and field training exercises of the NATO Enhanced Forward Presence battlegroups. 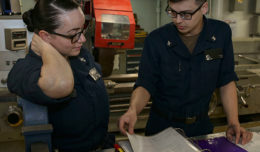 Prior to the start of the exercise, various units from Marine Forces Reserve conducted in-stream and pier-side offloads of equipment from United States Naval Ship Sgt. William R. Button, a Maritime Prepositioning Ship. 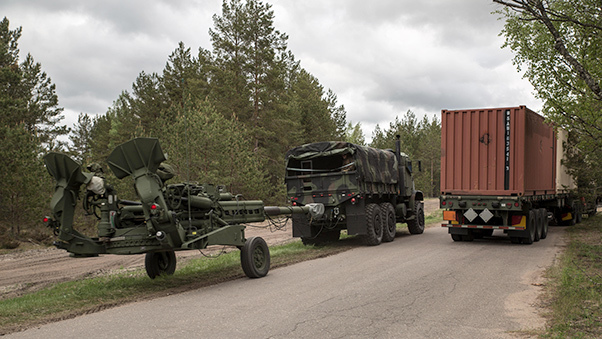 Other equipment was also extracted from Norwegian caves as a part of the Marine Corps Prepositioning Program-Norway to support the execution of this year’s iteration. Maj. Gen. Leonids Kalnins, chief of defense of Latvia, and Maj. Gen. Neal Loidolt, commanding general of the 34th Infantry Division, Minnesota Army National Guard, opened the ceremony with their statements. “I’m looking forward to the challenging, realistic, and successful exercise,” said Loidolt. 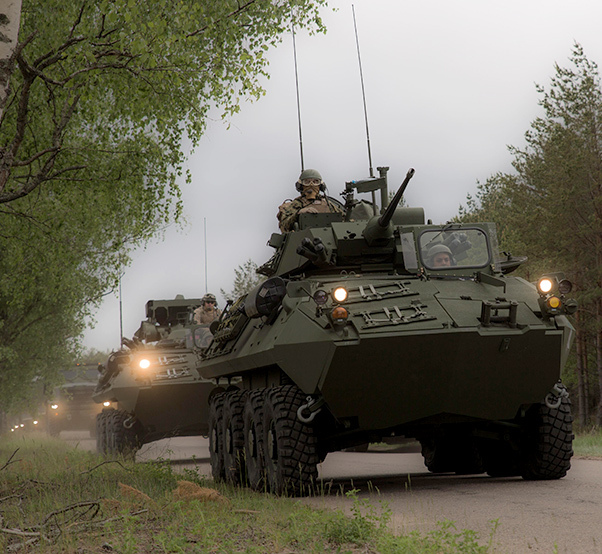 Marines with Charlie Company, 4th Light Armored Reconnaissance Battalion, 4th Marine Division, Marine Forces Reserve, operate Light Armored Vehicles by convoy from Ventspils to Adazi, Latvia, during Exercise Saber Strike 17, June 2, 2017. 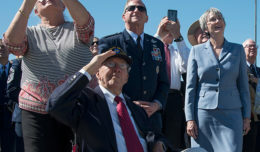 Both speakers emphasized the importance of strengthening each other’s capabilities, developing relationships and increasing readiness to deter any threat. 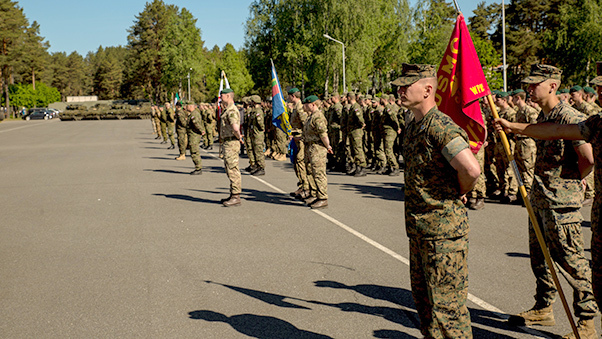 Eight of the 20 countries participating in the exercise to include Latvia, the United Kingdom, Italy, Lithuania, Norway, Poland, Slovakia, and the United States, stood together in formation as their respective flags were raised. “Exercises like Saber Strike allow us to enhance our interoperability and set the conditions for future operations,” said Col. Matthew Puglisi, U.S. Marine Corps task-force commander for the exercise. The exercise task-force command element is led by Combat Logistics Regiment 45, 4th Marine Logistics Group, Marine Forces Reserve. This exercise demonstrates the capabilities that reserve units bring to the fight from both a logistical and ground-combat element perspective; MARFORRES Marines are seamlessly integrating and providing support to the Marines of the Black Sea Rotational Force 17.1. “This exercise for Marine Forces Reserve demonstrates our ability to be ready, relevant, and responsive pushing forward and projecting our combat power,” said Puglisi. Marines with 3rd Battalion, 14th Marine Regiment, Mike Battery, 4th Marine Division, Marine Forces Reserve, transport multiple M777 Howitzers from Ventspils to Adazi, Latvia, during Exercise Saber Strike 17, June 2, 2017. Marines with the Black Sea Rotational Force 17.1 march in formation in preparation for the opening ceremony of Exercise Saber Strike 17 at Camp Adazi, Latvia, June 3, 2017. 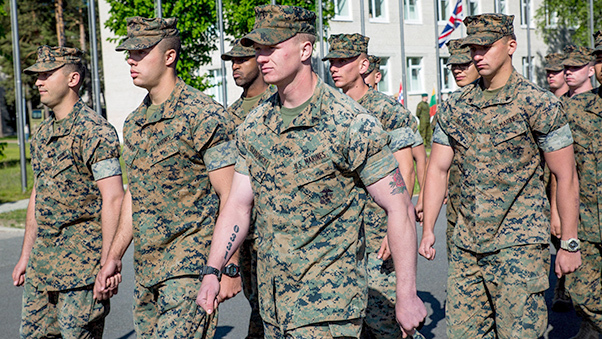 Marines with the Black Sea Rotational Force 17.1 stand in formation next to several other international military forces, to include Latvia, Italy, Great Britain, Lithuania, Norway, Poland, Slovenia and Slovakia, in preparation for the opening ceremony of Exercise Saber Strike 17 at Camp Adazi, Latvia, June 3, 2017. 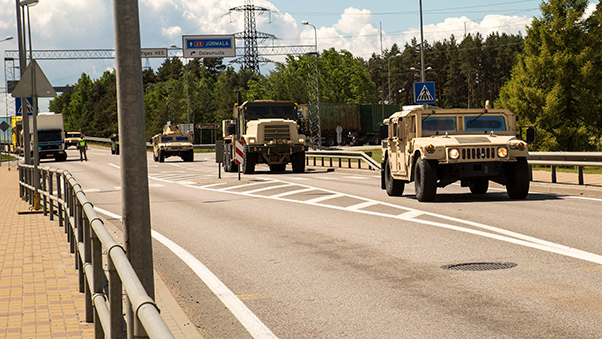 Marines with the Combat Logistics Battalion 25, 4th Marine Logistics Group, Marine Forces Reserve, transport equipment and personnel by convoy from Ventspils to Adazi, Latvia, during Exercise Saber Strike 17, June 2, 2017.